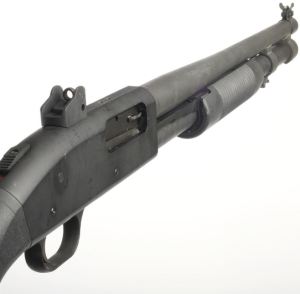 Mossberg is nearing its 100-year anniversary. This firearms manufacturer was founded in 1919, and for over 90 years it has been providing citizens, police officers, government agents, military personnel, and security freelancers with high quality firearms and accessories. It is easily one of the most recognizable names in the wide world of shotguns, along with companies like Benelli and Remington. In the early 1960’s, Mossberg released the model 500 pump-action shotgun, and the business of shotguns was never the same. Over its 50+ years of existence, the model 500 has proved itself as a rugged and reliable shotgun. It is the only shotgun which has achieved Milspec status, and is used by the military in different versions. The original 500 was introduced in 1961, but nowadays there are over 100 models in this ever-growing series of shotguns. The 500 Tactical is a lot like a Glock or an AK47 – it is relatively inexpensive, it is easy to use, and it just works. It is available in 12 gauge, 20 gauge, and .410 bore. 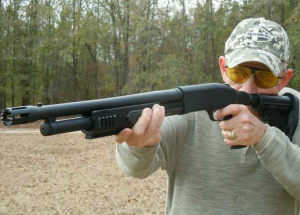 For all of these reasons, it has become one of the most popular shotguns in the world, and it is still going strong – as we will detail in our Mossberg 500 Tactical Shotgun Review. Here are some of the 500 Tactical’s specs. The model we will be reviewing is the 500 Tactical 6 shot. Barrel length – 18½ inches. Weight – 5.5 lbs (approximately). Sights – white dot sight. The receiver on all Mossberg 500 series shotguns is aluminum. 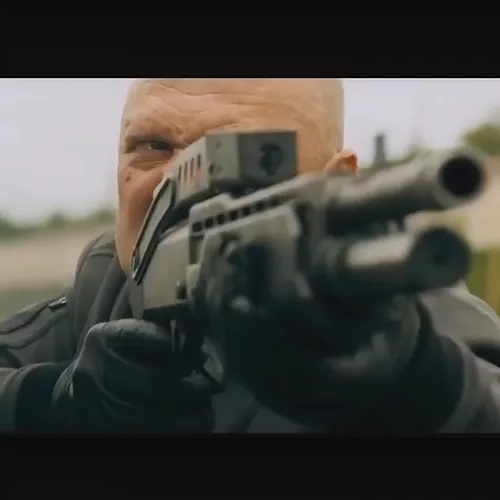 It has two action bars, which means that when you rack the shotgun, the pressure and force is applied in an equal measure. It has a 3-inch chamber, and a cylinder choke bore. The 18.5-inch length of the barrel is standard, and this in a way defines the Mossberg 500: cheap (not in a bad way), light, accessible, and functional. In terms of firing, this is one of the most fun-to-shoot shotguns out there. I love the sound of that pumping action, and it is one which I have grown to love. With an effective firing range of about 45 – 50 yards, it can be used in a variety of situations. 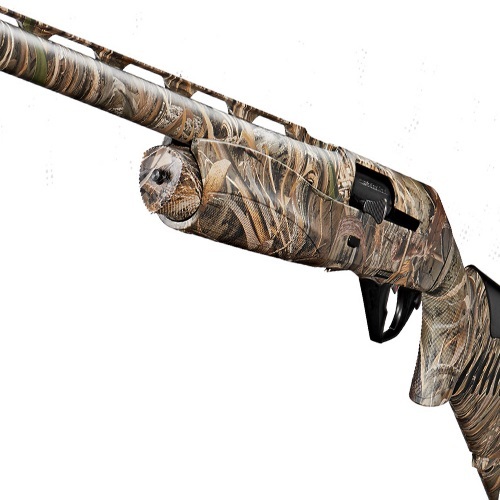 The six-shot version of this shotgun has a magazine with a capacity of – you guessed it! – six shells. There is also an eight-shot version, and many others. All 500 Tactical models have either six or eight shots. The white dot sight is one which has the ability to really light up, unlike the regular bead sight. The safety, unlike many other shotguns, is not on the trigger guard but rather on the shotgun’s top, above the action. It is a fairly easy manual safety to work with, although it can be a bit confusing to those who are not used to the safety being there. It is very useful, and can be engaged or disengaged without removing your hand from the shooting position. Your firing stance is important with every weapon, and this is also true here. When the safety is disengaged, a red dot will appear. It is completely visible to the shooter, and it helps with the firing process overall. 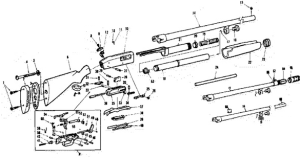 Assembly and disassembly are pretty intuitive processes. Even if you aren’t used to taking weapons or shotguns apart, you can see it through and repeat it fairly easily. Start by pulling the bolt back a little bit, unscrew the cap, and pull the barrel off. The trigger group can be then taken out by removing the appropriate pin. It lifts right out, and lets you remove the cartridge stopper and the bolt slide. The forend slides right off, and then you can remove the bolt itself from its housing. After that, you remove the shell elevator, and that is pretty much it. Clean, lube, oil – whatever it is you want to do with your 500, do it. Putting the 500 back together is little bit more difficult. Obviously, after a few cleaning sessions (which will probably be slow at first), you will get the hang of it. Assuming that we are dealing with a proper, working 500 model, everything runs smoothly. 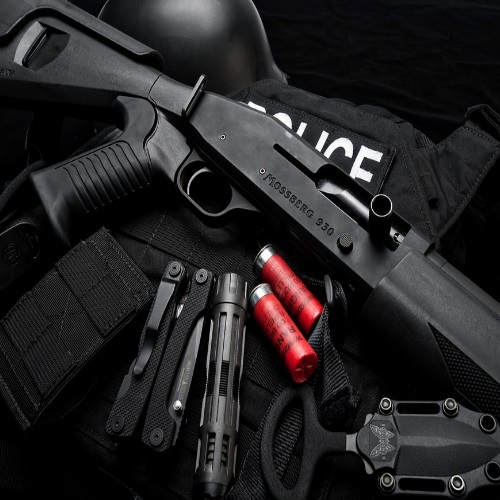 It is easy to see why this shotgun has become such a staple in American homes and police departments. The stock and pad on this model helps absorb recoil to a great degree. Stocks are part of where 500 models vary, in a big way. In this particular model, the stock is synthetic and has a black finish. The stock is nothing special, but it doesn’t need to be. Again, this is part of what makes the 500 a cheaper option. The 18.5-inch barrel is polished and has a blue finish. Bigger Safety Button: Since the factory safety is made of plastic, there are many who choose to purchase an oversize safety made of steel or aluminum. If you plan on wearing gloves, this is definitely a good option. Side Saddle Shell Carrier: Shell carriers are some of the best things you can get, if you are interested in more firepower. Additional ammo is always a good idea, and the sidesaddle allows you to keep engaging. You don’t want to be empty when the crap hits the ol’ fan. Magazine Extensions: Same reason as above. More firepower, high capacity, and more confidence. When it is late at night, and you are reaching for that shotgun, it is best to have as much ammo as possible. Optics: Flashlights, red dots, scopes. Some of the versions of the 500 series already come with scopes. Optics on the forend or top of the shotgun are many and varied. Depending on your intended use, you will find one that fits you. One version which has to be spoken of independently is the 500 Persuader. It is one of the greatest versions of the 500 around, in my opinion. It is drilled and tapped for any optics you want to add, and the pistol grip itself is great. It takes some getting used to, like other versions of the 500, and once you become more familiar with the pistol grip setup, it is a lot of fun to shoot. 6-shot capacity, 18.5-inch barrel, and it can be shot in a variety of stances and situations, thanks to the shorter grip and no need to rely on the shoulder for stabilization. I have mentioned the cheaper materials which make up the Mossberg 500, and this translates into a more moderately-priced shotgun. The 500 series will cost $300 – 700 or so, depending on your outlet and the condition of the gun if it is not new. RELATED: Check out our Glock (17, 26, 30, 36) and SIG (P226, P228, P229) Features! These are rare nowadays. The bullpup variant of the Mossberg 500 was produced from the mid to late 1980’s. It was meant for law enforcement purposes, and was discontinued in the very beginning of the 1990’s. Some of them are still for sale, though they are probably going for a lot more than the original ~$500 MSRP. The 12 gauge / 20 gauge discussion is a long one, and I am not about to get into it. Let me just say that it is all up to you. While some maintain that 20 gauge is too soft, and that only 12 gauge can give you what you need from a shotgun such as this, my personal preference varies with the shotgun. The Mossberg 500 tactical which I use is 20 gauge, and I have desire to fire any other, for now. I am cool with 12 gauge. Obviously, it is just as effective for certain people. It is all about your own intentions, your recoil management capabilities, and your shell preferences. It is an age-old debate, and there is no clear-cut winner. You’ll notice I never rule one way or another – whether it is accessories, gauges, or anything else – simply because “one man gathers what another man spills”. What fits you and your purposes may not fit another person. It is important to keep an open mind about such things. After all, even those two popular models have many variants in different configurations. 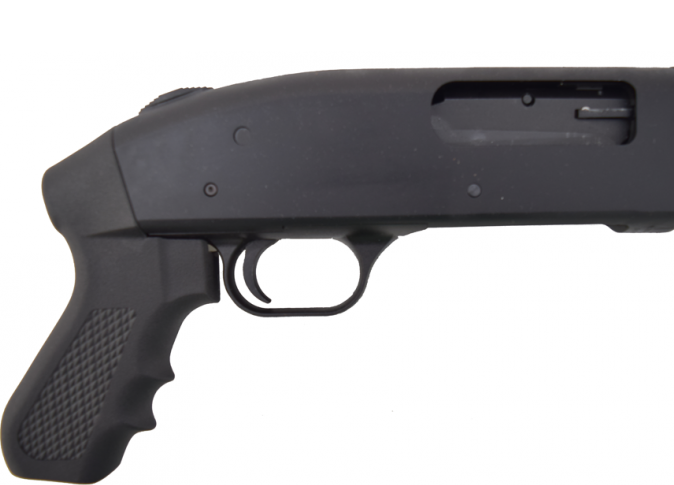 The Mossberg is relatively cheaper, and is also made from cheaper materials. The 870 has a steel receiver. The safety on the Mossberg, as mentioned earlier, is on a different, less-popular spot. The Rem 870 has an almost cult-like following, and to some extent this is true to Remington itself. They have been around for 200 years, and this firearms manufacturer is still as relevant and innovative as it ever was. The Remington 870 was first produced in the early 1950’s, and it remains an iconic piece of American history. The Mossberg 500 is a great shotgun, whether it is for hunting, tactical purposes, or home defense. The Army and police use it because of its ruggedness and adaptibility. This depends on your choice configuration, but generally speaking, it is one of the best bets on the market. You will not be disappointed with a 500 model, even if you use it right out of the box without any mods or additions. I have said this before: nothing says “get off my property” quite like the racking of a pump-action shotgun, be it 12 gauge, 20 gauge, or .410. Stay armed, stay safe, and use your right self-defense with a sound mind and a stout heart. Check out some of our other Mossberg features, like those covering the Mossberg 702 or 930, here at Gunivore!